Thanks to Shane for sending the above photo of one of our gifts being presented to Séan, an Irish National School teacher on his retirement. We are always delighted to design and engrave a unique gift mirror that is ordered for a special occasion in someone’s life, and we are very happy to say that the feedback we receive about our mirror engraving service is always very well received and welcomed. Many of our orders begin as enquiries to ask what would be possible to commemorate a special occasion such as a birthday, a retirement or an anniversary, and end up as a wonderful memento to help celebrate an achievement such as Séan’s. If you’d like to make an enquiry about one of our gifts for your upcoming celebrations, you can always send us an email. Finally getting around to send you on that picture of the presentation. 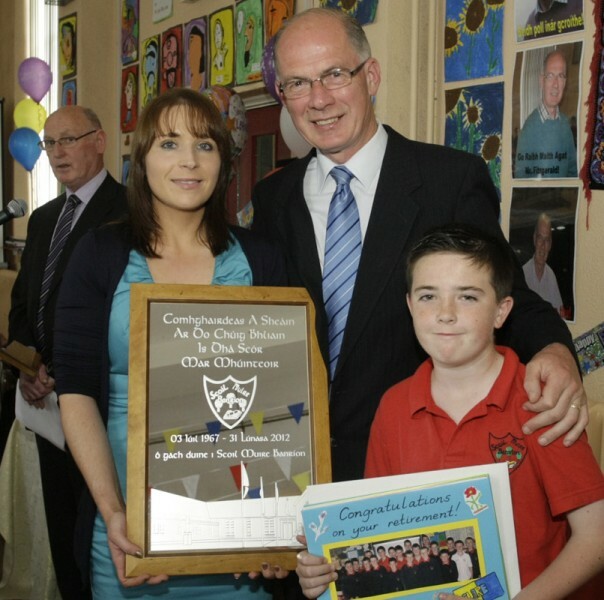 Seán Fitzgerald receiving the mirror from Charlene Dolan on behalf of Board of Management of Scoil Muire Banríon. Seán taught for 45 years in our school. Thanks for creating the three mirrors for us and I won’t hesitate in passing your details on to anybody who is looking for a unique gift.